Peering into the night sky, we’ve often waited impatiently for that streak of light that means a shuttle is heading into space. Since we moved to Florida, we’ve watched the launches from Jetty Park and from our back yard. Last weekend, the Space Shuttle Atlantis, which has traveled more than 125 million miles in space, was just a few feet away from us. 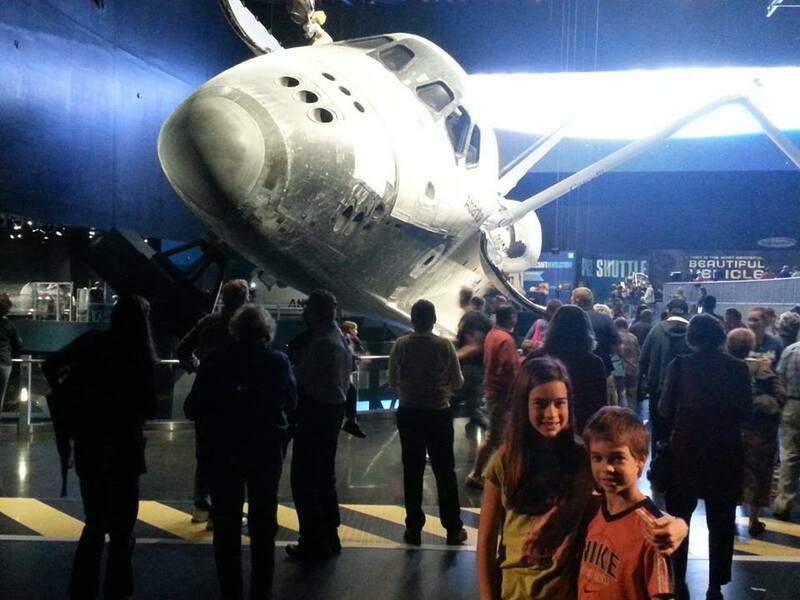 Our family went to Kennedy Space Center Visitor Complex to watch a movie that showed the rocket launch. Smoke swirled around it and, then, began to disperse. The door went up, and what happened next was awe-inspiring. “That’s when I had goose bumps when I saw how massive the shuttle was,” said Keith, our son-in-law. 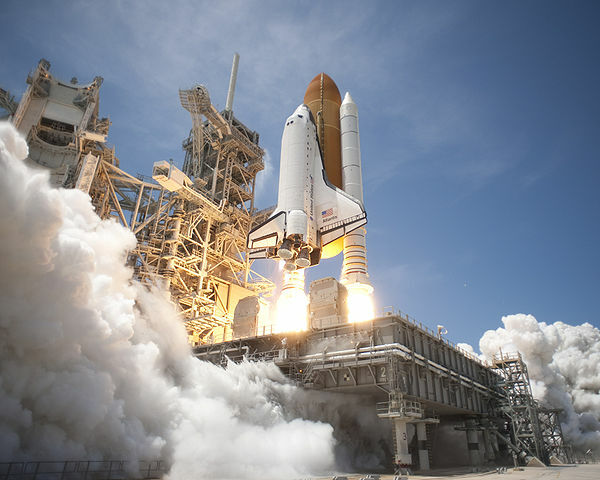 This shuttle, after 33 successful missions to space and back, is now the main attraction at the Kennedy Space Center Visitor Complex on Merritt Island, Florida. 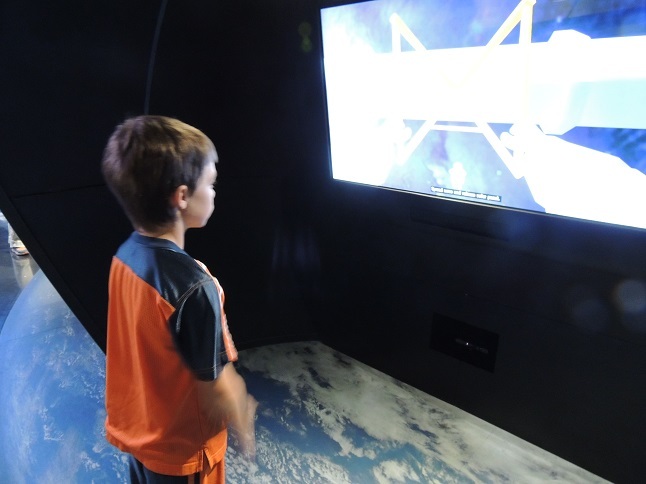 The $2 billion orbiter is in the “new six-story, $100 million, 90,000-square-foot exhibit that celebrates the people and accomplishments,” according to its website. What was even more impressive was when we talked to people who actually worked on the shuttle. “(Jean Wright) was one of the women who hand-sewed quilt patterns on the shuttle and used threads that could withstand up to 2,400 degrees,” said our daughter, Danielle. Wright told about how she helped make those quilted tiles which replaced 7,000 of the heavier tiles, mostly from the top of the shuttle. The quilted tiles made by the “Sew Sisters,” made the shuttle lighter and they were less costly to produce. Terry White also chatted with the guests. He showed us a square of the material that made up one of the tiles. Our grandchildren, Kaitlyn and Connor, watched along with the rest as he poured water into the tile. Our grandchildren aren’t hankering to clamber aboard the next shuttle. They say there’s still too much that’s unknown. But they found it thrilling to see the Atlantis, knowing it was in outer space and in orbit. How about you? Would you be up for a ride to the Space Station or to another planet? COPYRIGHT NOTICE: Judy Berman and earthrider, 2011-15. Unauthorized use and/or duplication of this material without express and written permission from this blog’s author and/or owner is strictly prohibited. Excerpts and links may be used, provided that full and clear credit is given to (Judy Berman) and (earthrider, earth-rider.com, or earthriderdotcom) with appropriate and specific direction to the original content. I’ve always said I wanted to go to the Moon or Mars. Whether I would actually go, if given the chance, is another matter. Great post, Judy. What do you think is next for the space program? Mars would be my first choice even after reading Ray Bradbury’s scary stories about the planet. Glad your enjoyed NASA’s next move would be. He think: Mars. I think that has a lot of potential and would help us understand why they once had water and now, apparently, don’t. I find the observation of real trips into space so much more compelling than movies that play off the subject. I want NASA up and exploring. However, I myself am too much of a ‘fraidy-cat to take the trip. I’m with you Mark. While Mars sounds like a fascinating place to visit, I’d rather stay terra firma. I’d love to see what astronauts discover there. Nice to read about your trip and goosebumps adventure. Imagine such designing process. Wow. We have yet to venture over there and reside about 4 hours away, but your post makes me want to visit soon !! The visit will be well worth it. You could spend hours in the one building alone. We also got to meet one of the astronauts. They have great IMAX movies and many other attractions, including one of the wildlife – which I’ve only seen from the bus traveling from one of KSC’s sites to another. Brand new detail for me about Jean Wright using thread that could withstand heat to 2,400 degrees to sew the quilt patches for the shuttle. WOW! I can’t imagine that thread! Jean Wright really amazed us by the handsews – not machine sewn – work that went into those tiles.. She showed us that if you knotted that same thread that it broke quite easily. Fascinating lady. I’ll stay earthbound but I’ve seen a launch and that does give me goosebumps. I find the idea of the space program just intriguing, there is just so much to think about, and that is exciting to me. Looks like you all had a fun day, it is too bad Vern and I don’t have weekends off so we can go with you on these fun outings. Great story about your KSC adventure, Judy! I enjoyed it all. My great-grandmother used to sew everything for folks by hand, especially wedding dresses, with no patterns. She would’ve been amazed at the super thread, I’m sure. Your story is so nice because it includes current events, historical perspective, and family. Thank you for your comments, Trish. Until that visit, I had no idea that some of the shuttles’ tiles were hand sewn. A lot of work by some very dedicated people. I don’t think I’d be wanting to clamber aboard either – it must be quite an experience, and not one that appeals that much to me. Seeing earth from up high would be quite a stunning and emotional view though – that bit does appeal, but not enough to be the first in the queue! 🙂 Strange really, you’d think with me being a Doctor Who fan I’d love it, but I’ve never really been a space fan, or fan of the first man on the moon either. I guess I prefer my moon/spacemen to be encapsulated in fiction – it feels safer that way! Well, Suzy, we live about 30 miles away from where the shuttles launch. So it is like a large firework. 😉 But it is still impressive as it streaks across the sky. The night we returned from Costa Rica, we happened to be coming home just as a shuttle was launched. It was night and it was amazing. I’m also a Doctor Who fan (since this past summer), and I loved Star Trek and Star Wars. That being said, I’m more comfortable on terra firma and admiring the photos sent back to Earth. To see something that amazing will give me goose bumps too. What an unforgettable trip. I hope to bring my son to NASA soon here in Houston. Remembering that first step on the moon by Neil Armstrong still takes my breathe away. Happy Holidays. Out of this world post, Judy, but I prefer to stay grounded, thanks! You’re welcome. 😉 I’m with you, Lisa. I’m pretty attached to Mother Earth. On a related note, did you hear that Nasa is sending cress seeds to the moon to grow lunar salad? Simply wild! I don’t think I’m adventurous enough to withstand space travel. Your travel pieces are written so well, I’ll let you go in my place. You can write about it and I can live vicariously through you. Thanks for the compliment, Paprika. But no dice. I’ll be right here with you watching the flight from terra firma. Chris Kridler's Sky Diary Storm-chasing, photography and rainy-day tales. Murphy's Craw Whimsical wanderings on writing, movies and TV. Judy Berman and earthrider, 2011-16. Unauthorized use and/or duplication of this material without express and written permission from this blog's author and/or owner is strictly prohibited. Excerpts and links may be used, provided that full and clear credit is given to (Judy Berman) and (earthrider, earth-rider.com, or earthriderdotcom) with appropriate and specific direction to the original content.